You can't stop your emotions. But you can learn to work creatively with them. 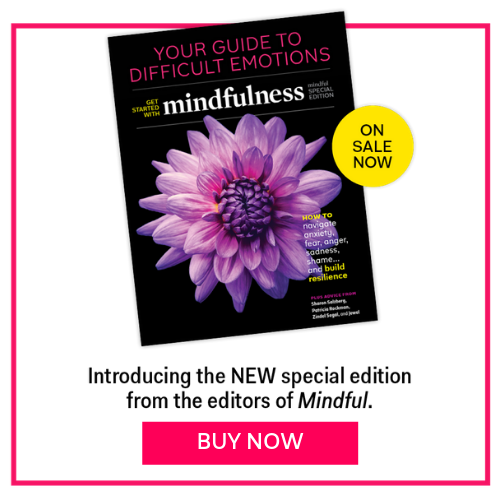 Try this practice from Mindful magazine. Our brains are wired to focus on fear as a method of ensuring our survival. As a caveman, this was a very important life skill. If our ancestors didn’t over-react to every rustle in the trees, they could be attacked and eaten by a lion. We, on the other hand, are not threatened by literal death on a daily basis. Instead, we are threatened by our email inbox, traffic, our boss’ approval, our children’s safety, and many other daily occurrences that create a strong sense of anxiety and fear. As with all emotion, the practice of meditation can stabilize us enough in the midst of fear to help us see more clearly—to distinguish a false threat from a real threat that needs to be acted upon. The type of fear meditation can have the most effect on is the fear (and fears) that we continually generate in our own minds, the product of our rich imagination and our desire to control everything, rather than be tossed around in the risky and stormy world. Try this meditative practice for working with fear, from the June 2014 issue of Mindful magazine. You can also click the image below to enlarge it.